SONATS has developed a portable shot peening solution that goes beyond the limitations of conventional shot peening. 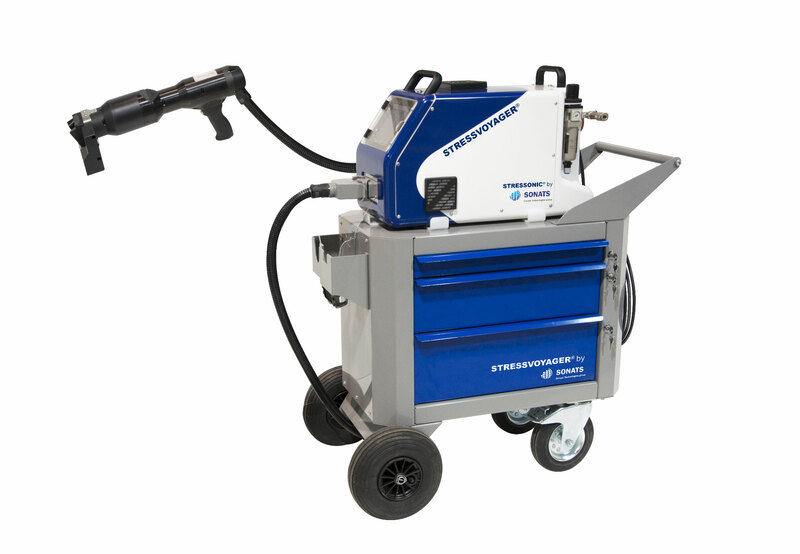 The STRESSVOYAGER® USP is a portable ultrasonic shot peening equipment equipped with STRESSONIC® process, that can be used for the treatment of metal parts in the workshop or at the customer site for preventive or corrective action to improve their reliability and fatigue resistance. This technology is ISO 9001, EN 9100 certified and follows the aeronautical recommendations BNAE NFL 06 833, SAE AMS 2580 and SAE AMS 2585. Can be applied by your own team because it is simple to set-up and use. SONATS can also send our team to your site to carry out the shot peening treatment. Because each ultrasonic shot peening treatment application is different, tools are custom designed and the control parameters defined by our services are specifically adapted to the work piece. These specifications are used to ensure a completely hermetic enclosure. Optional specific systems have been designed to ensure that no beads are lost before, during or after treatment. The shot peening bench is a semi-mobile equipment ideal for a workshop dealing with small and medium runs. For MRO, it is also suitable for the treatment of parts in need of repairs. Linked with a USP STRESSVOYAGER®, the process remains automatic. SONATS manufactures shot peening bench depending on your needs, on the dimension and weight of your workpieces. As standard, we propose a bench with a dimension of 1100x1500x1000mm. An acoustic element to be adjusted in height and reclining is placed in the middle of the bench equipment. Through trays mounted on linear axis which can be manually moved, it is possible to precisely adjust different toolings necessary to the different geometry of your workpieces. Once the tooling is placed, shot peening operations can be realized with a high degree of repeatability without manipulation from the operator (except part loading and unloading ). This is a cost-effective equipment; which represents an intermediary solution between a portable equipment, the STRESSVOYAGER®, and a stationary automated machine. 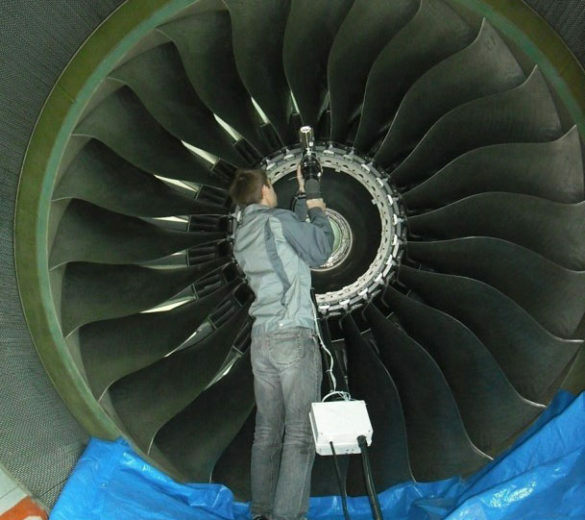 Our technical solution provides the ability to re-establish the beneficial compressive residual stress to the surface of critical aircraft components (FAN Disk) without disturbing surrounding components in a field or depot environment rather than at the OEM’s location. 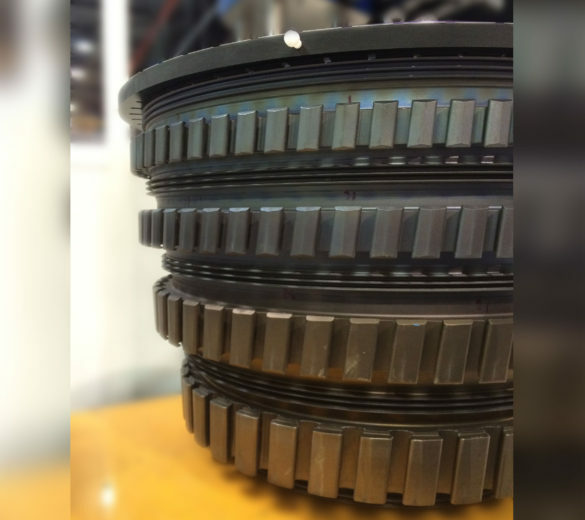 STRESSONIC® technology provides the ability to restore the beneficial residual compressive stresses that were introduced to the surface of the part during original manufacturing. The portable equipment reduces aircraft downtime, supply and distribution requirements, decreases stock forecast, and increases flight readiness. Processing time reduces to 3 days instead of 1 month for standard shot peening operation. 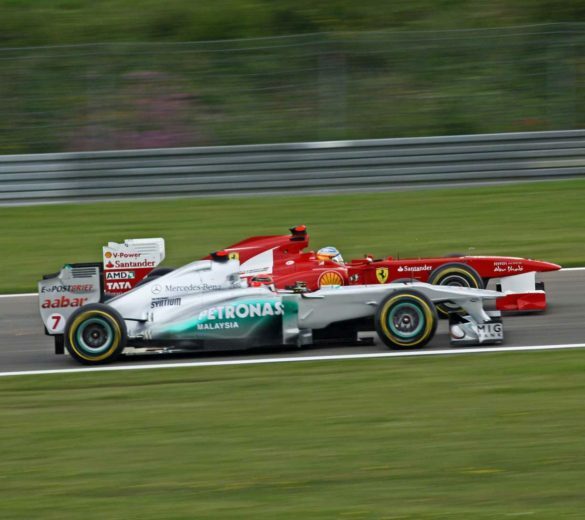 In 2018, a new regulation requires the Formula 1 teams to use only 3 engines per driver and per season (unlike in previous years). However, the design of existing engines is not adapted to these new requirements. 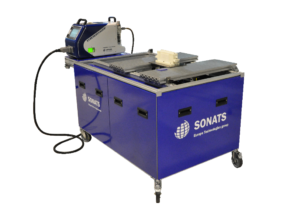 So SONATS deployed portable equipment, the standard STRESSVOYAGER® USP on a circuit, for the corrective treatment of high-performance engine parts (crankcases, cylinder heads, etc.) to improve their fatigue strength. Using a small peening chamber allows only the repaired area to be peened and precludes shot media from escaping into other areas of the work piece.